Some Gram-positive bacteria, are able to survive unfavorable environmental conditions for extended periods of time (can be hundreds of years) by forming protective endospores through a process called sporulation. Some species of Bacillus and Clostridium have medical significance. 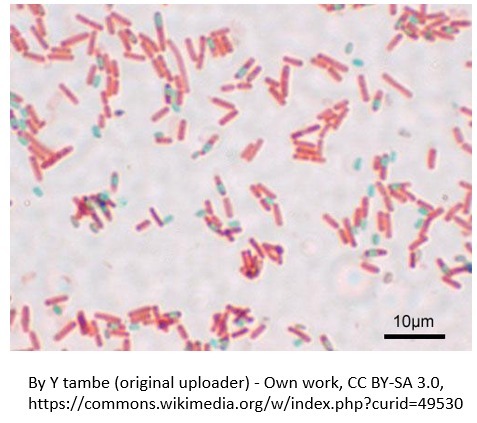 Clostridium perfringens, C. botulinum (a potential agent of bioterrorism) and C. tetani are the causative agents of gas gangrene, botulism and tetanus, respectively. Bacillus anthracisand Bacillus cereus are the causative agents of anthrax and a self limiting food poisoning, respectively. Endospores are also not easily penetrated by staining procedures. Heat needs to be applied to help the stain enter the endospore. This heating process acts as the mordant. In this staining procedure, the endospore will be green due to the malachite green and the vegetative cell will be red due to the safranin. The endospore stain is a differential stain used to visualize bacterial endospores. Endospores are formed by a few genera of bacteria, such as Bacillus . By forming spores, bacteria can survive in hostile conditions. Spores are resistant to heat, dessication, chemicals, and radiation. In order to destroy these resilient endospores, they must be autoclaved (moist, pressurized heat) for 15 to 20 minutes at a temperature of 121°C. Watch this video courtesy of wikimedia on how autoclaves work. 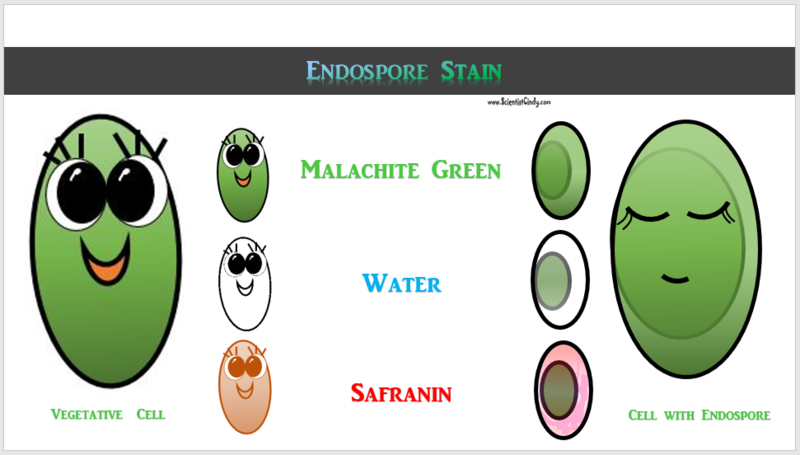 Endospore Staining is helpful for identifying bacteria that have endospores. Endospores are protective structures that are used to withstand unfavorable conditions. Endospores are difficult to stain using normal techniques like Gram-stain and simple stains. Types of endospore staining include the Schaeffer–Fulton stain and the Moeller stain. The primary dye for endospore staining is malachite green. It takes a long time for the spores to stain due to their density, so time acts as the mordant when performing this differential stain; the slide with the bacterium should be soaked in malachite green for at least 30 minutes and then rinsed off with water which acts as the decolorizer. A counterstain to differentiate the vegetative cells is commonly 0.5% safranin. The endospores stain green and the rest of the cells picks up the pinkish-red counterstain. 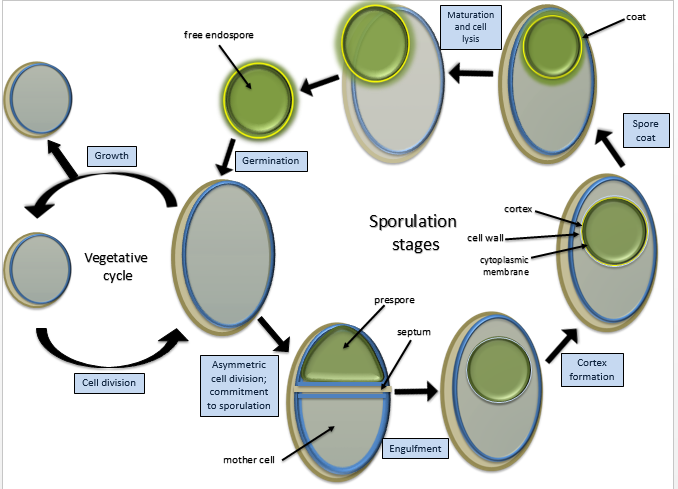 The endospore will often appear as a green spot within the cell.